Garde Champetre and Nina Carberry take the last to win the BGC Handicap Chase (Cross Country Chase) in facile fashion for Enda Bolger. Nina Carberry became the most successful woman rider at the Cheltenham Festival when scoring on Garde Champetre in the BGC Cross-Country Handicap Chase. Carberry was recording her third Festival success - one more than Gee Armytage - following victories on Dabiroun in the 2005 Fred Winter Novices’ Hurdle and Heads Onthe Ground in the 2007 BGC Cross-Country Chase. Carberry said: "I was on the best horse on the day - he’s a very classy horse. It was great to be able to sit up there and just enjoy yourself." "It all went very well. There were a few little mishaps round. Enda did a great job with him and he seems to be going a little bit slower in his racing now and seems to be loving it again. His old sparkle is back. "I think horses either enjoy the course or they don’t. He shown the horse he is today. I got to the front way too soon on him, but he did it well. I though he might pull up in front, but he did it well and kept going. "Enda’s unbelievable. He shows us every year and I don’t think anyone could copy him now. A lot of work goes into the horses at home and he has a great set and I’m delighted for everyone at home. "The first time I entered the winners enclosure here was good, but I’ll never tire of coming in here." Garde Champetre, who became a third winner of the race for trainer Enda Bolger, has taken to cross-country racing with enthusiasm, although he is equally famous for his 530,000gns sale tag, which was the sum owner J P McManus gave for him at Doncaster in May 2004. The price remains the highest for a male horse sold while in training. Bolger said: "He’s just starting to enjoy himself, but I didn’t expect him to win that easily." Asked whether, after three victories, it was getting routine to win this event, Bolger, who saddled three runners, said: "Far from it. It certainly doesn’t seem so standing in these shoes. "Freney’s Well [fourth] ran well too, while top-weight anchored Heads Onthe Ground. Please God, they will all go to Punchestown, where there’s a new cross-country race over 3m1f. Garde Champetre could go for that and Heads Onthe Ground will tackle the La Touche Cup. Then hopefully Garde Champetre will come back here in the autumn. "The minute we introduced him to this type of racing he was a duck to water. The boss [McManus] just said to me, ‘Give him a try, but if he doesn’t take to it we’ll go back to chasing’. It’s no credit to me, because he’s a high-class horse and they go a different gear in these type of races. It suits him, and with one of the best [amateur] riders in the world on his back away you go." Fourteen-year-old Native Jack, winner of the race two years ago, had not run since a disappointing performance at The Festival last year but delighted connections with a staying-on second. Trainer Philip Rothwell said: "We're ecstatic. He's been off the racecourse since this day last year and I asked the owners to give me a chance to bring him back once more. This is super, he wouldn't have liked the ground out there at all. He's way better on good ground but he finished well and it's great." Niall O'Farrell, one of Native Jack's four owners, said: "He's been fantastic. We won two years ago. Last year we brought him back for a lap of honour. He was really well during the summer but we didn't know if we were going to retire him so we're just delighted he's in such top form today." Michael Hourigan, trainer of third-placed A New Story, said: "I'm very, very pleased. He's a bit of a character of a horse but he loves it round here. He wings fences and he's only jumped about 15 banks in his life so I'm delighted with how he's taken to it today. We'll be back in November." Class 2, £50,000 Total Prize Fund. 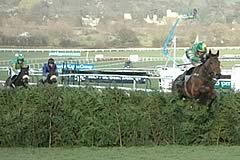 Cheltenham, 4.40pm, Tuesday, March 11, 2008, three miles and about seven furlongs. For five-year-olds & upwards. 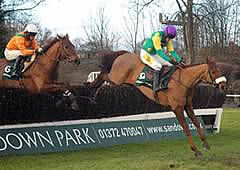 Penalties: after February 24, 2008, a winner of a steeple chase 7lb. No penalty to increase a horse’s weight above 11st 12lb. Entries closed February 19 (41 entries), entries released February 21, weights revealed February 27. Six-day confirmation stage March 5, final declaration stage 10.00am, March 10. Form figures supplied by Weatherbys and are correct up and including the racing of Monday, February 25, 2008. May not include some overseas form. 2. It is one of three races run over the cross-country course at Cheltenham during the season and follows on from the BGC Cross Country Chase at The Open in November and the BGC Cross Country Chase at the Boylesports International in December.